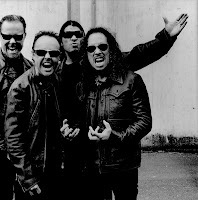 Rockers Metallica have announced a director for the upcoming Metallica 3D featur e film project. They've tapped award-winning director Nimród Antal for the Charlotte Huggins produced project. The film, a mix of narrative and concert, will star the members of Metallica and the fans. It will begin filming in August and is scheduled to be released in the summer of 2013. "I've been a fan of Nimróds since his first Hungarian film, Kontroll, showed up at Cannes in 2004 and blew everybody away, said Metallica's Lars Ulrich. "I've watched with excitement his career in Hollywood blossom over the last few years. Within five minutes of meeting him I was addicted to his enthusiasm, his take on the creative process and his "thinking outside of the box" personality. Let's get on with it!!!" "Metallica has always been a huge part of my life, and it's an incredible opportunity when we get to work with our heroes," said Antal. "We are going to harness the powerful and almighty energy of Metallica's live shows, inject a narrative into it, and shoot it in 3D to elevate the entire experience."